Learning how to cook bacon in the oven has been a serious kitchen game-changer for me. Aside from being so simple, the final product is absolutely perfect every single time! I’m confident that after you use this method just once, your bacon game is going to completely change! Using thick cut bacon? My recipe uses regular slices, but this method will still work great. Depending on the thickness, the cooking time will likely be longer. As mentioned in the recipe, DO NOT preheat your oven. This method prevents the bacon from curling and reduces bacon fat splatters. I almost always use an aluminum foil lined baking sheet when cooking my bacon, but parchment paper also works. I do recommend one or the other, as the sheet pans can be annoying to clean. Be aware that wax paper and parchment cannot be used for the same application. Wax paper will smoke and should never be used in the oven. When you lay the bacon on the baking sheet, they can touch (they’ll shrink) but try not to overlap the slices. My recipe instructions are for crispy bacon with a slight chew. Reduce your time to 20 minutes for softer bacon or try 35-40 for even crispier bacon. Just to be on the safe side, I would start checking your bacon after about 15 minutes. Instead of using paper towels, a cooling rack can also be used to drain any excess fat from the bacon. Save your excess bacon fat by filtering it through a mesh strainer and storing in a glass jar or bacon grease container. It’s important to remove any excess bits from the bacon fat or it will go rancid. Use it anywhere you would normally use oil or butter for cooking. If you’re feeling adventurous, you can try my Bacon Mayo recipe! Meal prepping? Store cooked bacon in the fridge and grab it whenever you need it! 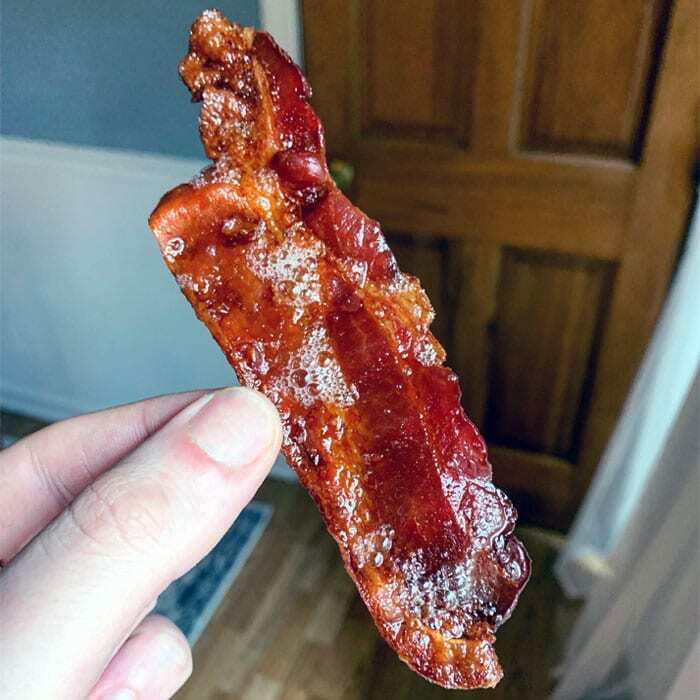 If you have an air fryer, this bacon heats up beautifully at 350º in minutes. Don’t burn the bacon! This is the only thing you need to watch for. But let’s be honest, burnt bacon can still be delicious. 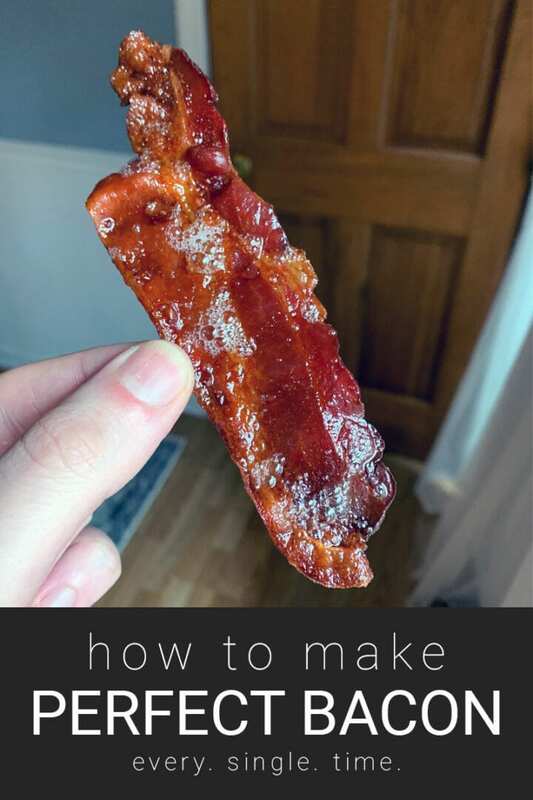 My method for preparing bacon in the oven is simple and full-proof -- two of my favorite words! On a foil-lined baking sheet, place a single layer of bacon. They can touch (they'll shrink when cooking), but do NOT overlap. Place into a cold oven and set the temperature to 375º F.
Cook until desired doneness. I like mine crispy with just the slightest bit of chew. For me, the sweet spot is right around 30 minutes. Using a fork or metal tongs, transfer bacon to a plate lined with a paper towel to soak up any excess fat. Strain the excess bacon fat from the tray and use in your cooking. It's amazing! Perfect is an adjective I very rarely use, let alone with food. But in the case of preparing bacon, it’s a fitting title! Nothing will fill your home with a better essence than bacon cooking in the oven. Have you ever had oven baked bacon? Comment below! Does the cooking time include the time it takes to get the oven up to 375? e.g. if my oven takes 15 minutes to heat up, do I cook for 30 min or 45? The 15 minutes will include the heat up time as well, so put it in the oven and then turn your oven on. My daughter oven bakes the bacon all the time. However, my oven is now a complete mess. Is there any way to keep from ha ing bacon grease all over the oven? We do love how the bacon turns out. Hmm, I would suggest maybe a baking sheet with a thicker edge or you could try putting a layer of parchment on top when baking. That would prevent it from shooting across the oven. I haven’t had any issues with grease in my oven though, so hopefully this helps! Love that idea! Do you find that its still easy to clean? I love when I can just toss the foil afterwards and still have a clean pan. Doesn’t this splatter all over your oven and create a mess? Nope! No mess, and easy clean-up!